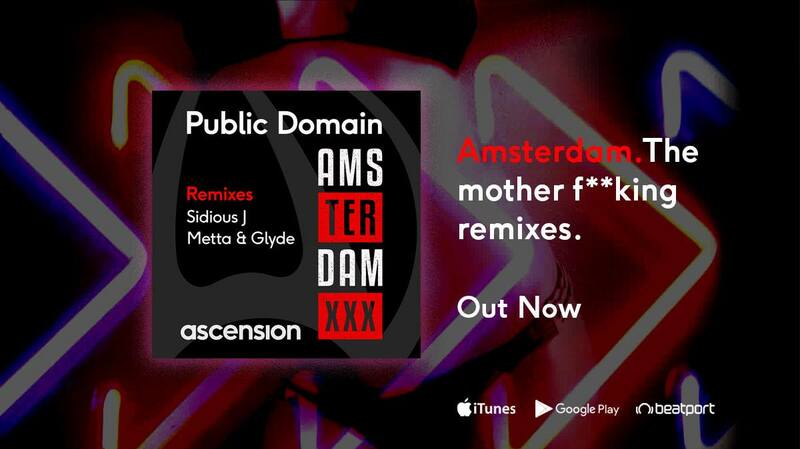 The hard-edged Euro export 'Amsterdam' from Public Domain returns on Ascension® Music with this epic remix package. On the uplifting edge, trance duo Metta & Glyde return with their distinct energetic euphoric style, fusing their roof raising riffs and acids with some insane glitching. This is one for the peak time. For the house and techno dance floors, Sidious J unleashes audio anarchy with his dark and twisted underground sounds, combining his signature basslines, driving percussion and dark vocal FX in this monster of a remix. Support from: Arctic Moon, Kutski, Trance Army, Aimoon, Glojin, Unit 13. Played on air on the Grotesque 300 warm up and live at Dreamstate LA. Praise from: Giuseppe Ottaviani, Simon Patterson (Stadium Artists), Manuel Le Saux, M.I.K.E Push, Brandon Block, Andi Durrant, Sam Mitcham, John Gibbons, Madwave plus many more. As featured in January 2018’s edition of clubbing bible Mixmag.